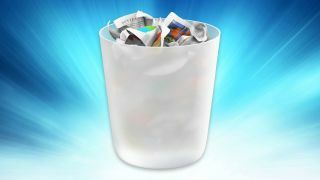 Gone faster than you can say "Trash Can"
You know the drill: when you want to delete a file on your Mac, you have to move it to the trash can sitting in the Dock (or select the file and press Command + Delete). Once in the trash, you must empty the trash for OS X to begin reclaiming the drive space. But no longer. Now you can skip the trash entirely and delete a file on the spot in OS X 10.11 (El Capitan). Continue reading and we'll show you how it's done. A new feature in OS X El Capitan lets you skip the trash when deleting files from the Finder. It's a relatively easy process. 2. Select the file you wish to delete. 3. Hold down the Option key on your keyboard. 4. Move your cursor to the menu bar and click File > Delete Immediately. 5. Agree to the confirmation dialog that appears letting you know this action cannot be undone. That's it! The file you selected will be removed in one go. However, if you want to make the process go even faster you'll want to use the keyboard shortcut instead. Pressing Option + Command + Delete when a file is selected will perform the same action.